Just a short post, this is the revised print that I posted on Easter, link, this time with the second color. I’m hooked, if reduction relief did not work for me, individual color plates do. A certain obsessive compulsive inclination is satisfied by working each plate meticulously so that the image aligns. This is by no means a perfect print, the alignment is most noticeably askew when looking at the Princess’ upward reaching hand. But now I have a better grasp on the process and feel confident enough to work with more color, quite a relief -lame printmaking pun intended. 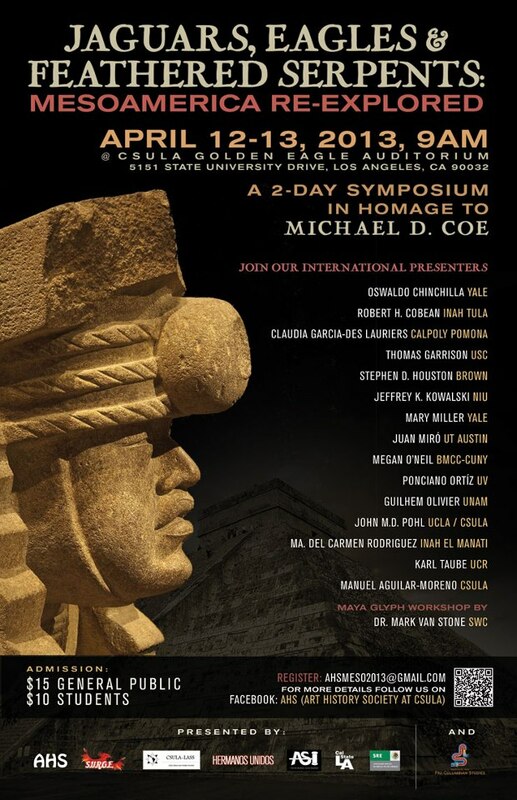 I am attending a Mesoamerican conference this week in LA, I’m very excited, two days of Meso fun. Starting off with a workshop deciphering Mayan glyphs, I haven’t great expectations, but if I can recognize just a few glyphs I will be pleased. The spouse has arranged a vacation in Mexico City for the Day of the Day festival ; I’m eager to check out the museums and the ruins, planning a trip to Teotihuacan as well. I am in my second semester of printmaking and frankly it has been disheartening. The exhilaration of the first few prints, successful or not, has been eclipsed by technical problems, some seemingly insurmountable . 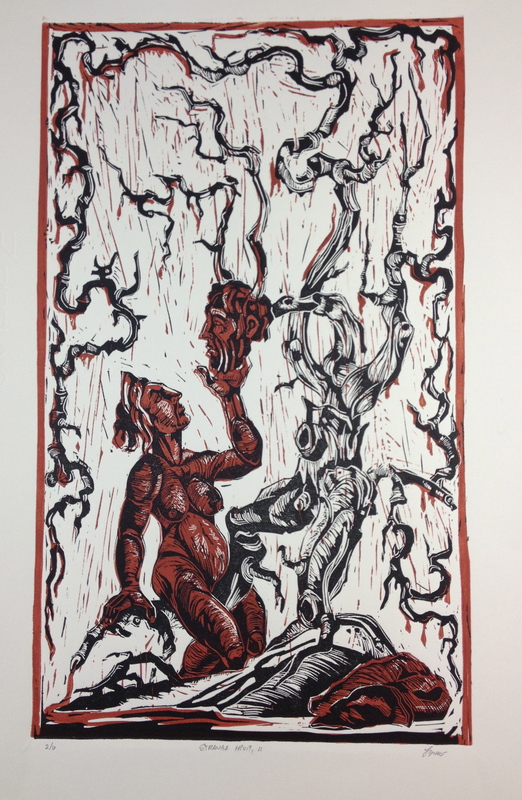 I recently finished a labor intensive, time sucking reduction relief print, a technique in which one linoleum plate is used, and each color is ultimately scraped away for the next. Engineering the color seqquence was daunting enough, but I think I was able to resolve that issue; but by my final press, down to final color, a sepia, the finished result was disastrous . I was taken aback by my visceral disappointment to the final image, I frankly had to walk away. I still have not have had the will to face the sad pile of wasted paper, ink, time, effort and optimism; spring break ends Sunday, perhaps I will face my demons on Tuesday. In the mean time I am determined to avoid that sad route, eliminating reduction reliefs with individual plates for each color. This was my initial instinct but the assignment demanded the one plate approach. The following, the first printing thus far, is the line work. The second plate, most likely red, is still being carved out. I post this unfinished print as it is appropriate to Good Friday, a day of sacrifice and reflection, frankly my favorite holiday of the christian calendar . 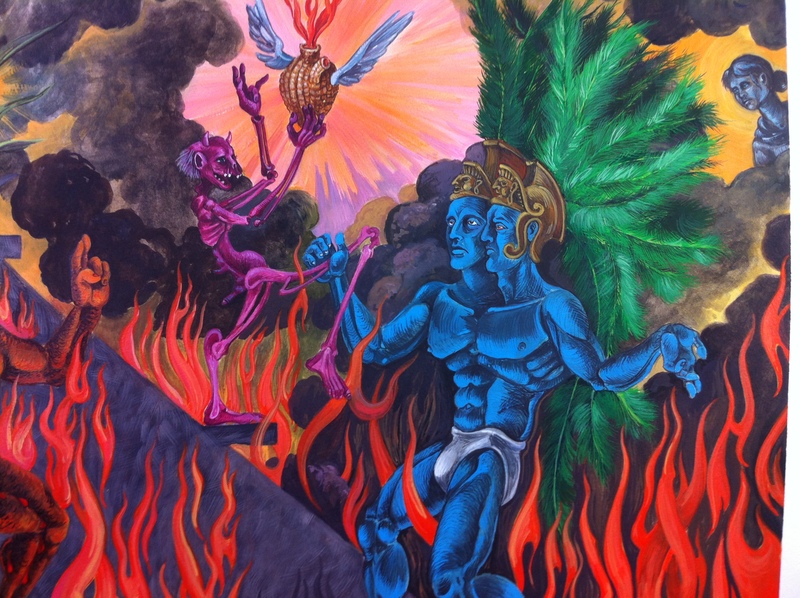 This image which is one I have explored several times is that moment in which the Maize God, the savior character from the Popol huh,is discovered by the princess of the Underworld Xquic. This fateful encounter results in a miraculous virgin birth, the severed head of the Miaze god spits into the open hand of the virgin princess (subtle Freudian imagery). Clearly I am fascinated by this twist of our familiar Christian sacrifice & rebirth theme . Wishing all a happy Easter if so inclined, certainly happy spring Sunday. Progressing forward on the Primer of New Spain. As I mentioned last time I will be jumping about the alphabet. As I began with “A”, “X” seemed the logical choice. 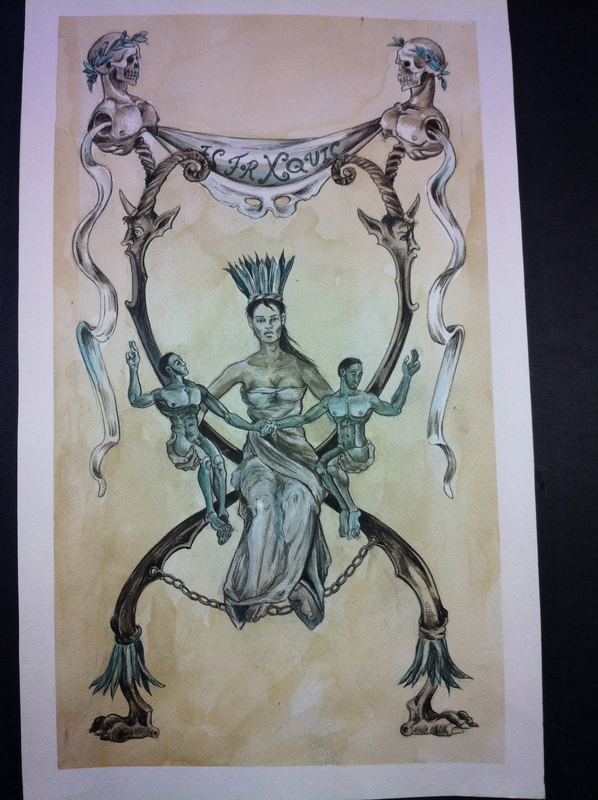 I chose Xquic, the princess of Xibalba. For those who have followed this narrative , and not been daunted by the tongue twisting names, you will remember she is the heroine of the Popol Vuh narrative. Having miraculously given birth to the Hero Twins, I present her enthroned upon an “X” chair. 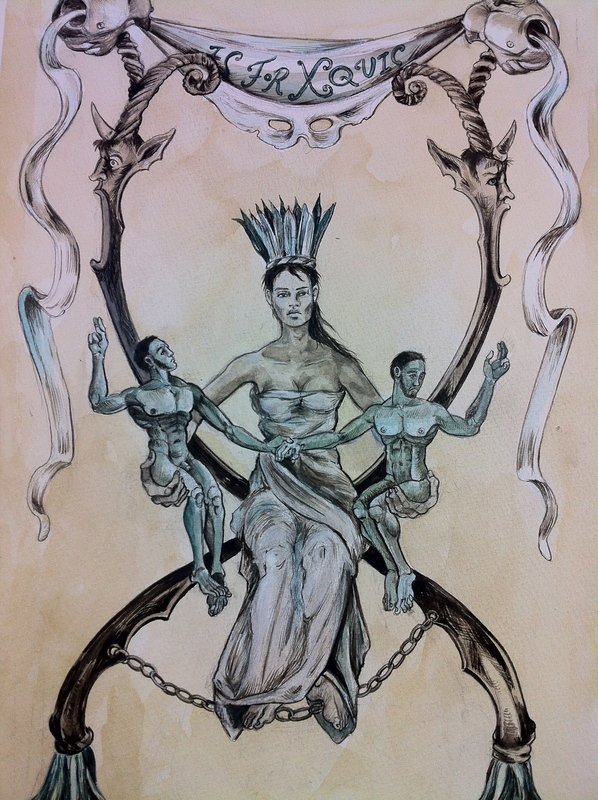 The following is a detail (as the image is rather small) of Xquic and her sons the Hero Twins, Hunahpu and Xbalanque. 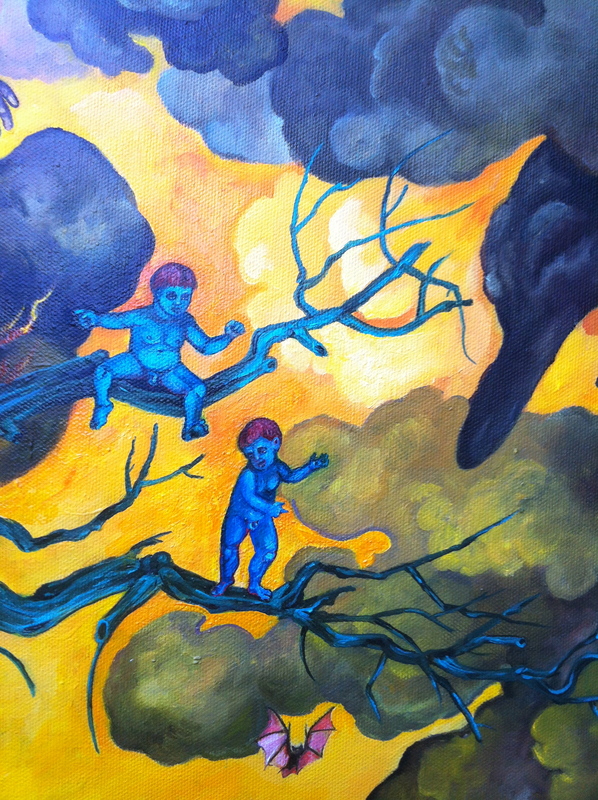 As I progress in this series I continue to paint the Twins blue. There isn’t a tradition for this, I just like the effect, an homage to Clive Hicks-Jenkins. This may be the last post for a bit, trying to tie up loose ends as we are leaving for a brief Independence Day holiday. We are going to Portland Oregon, it seems such a pretty and progressive place; far different temperament and climate from oppressive San Diego. We are both excited to get out of Dodge. 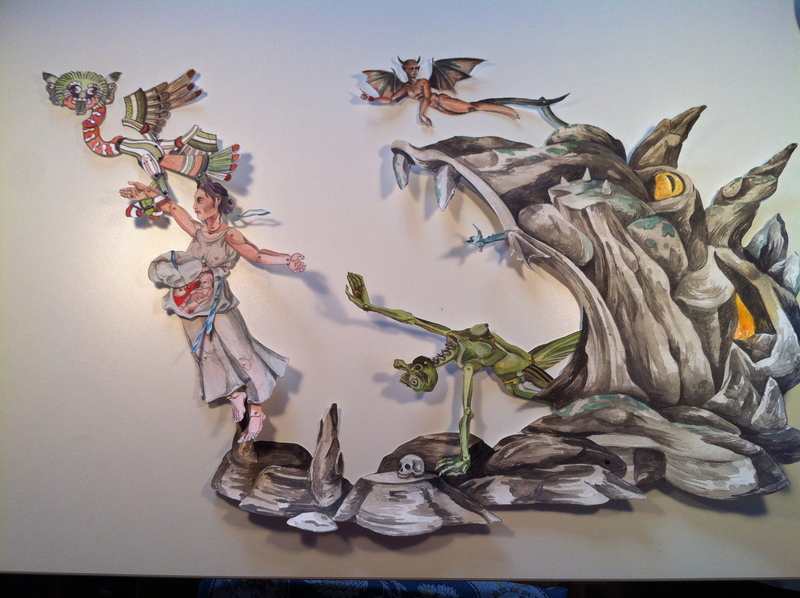 Back in March with a batch of “paper dolls” (my mother-in-law’s description of my maquettes) in front of me,I created a composition that I thought might be suitable for a painting. 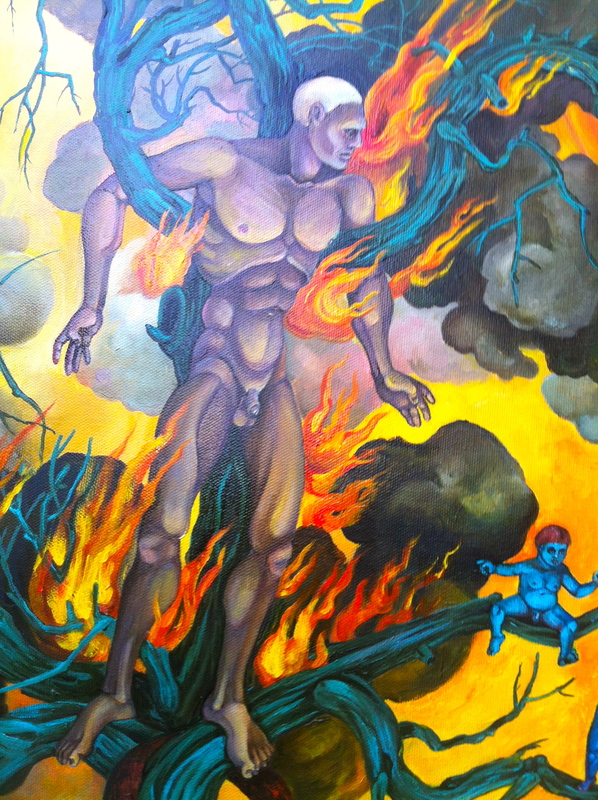 The painting ,to be part of a cycle devoted to the Mayan creation myth, the Popol vuh. Working from the above mentioned composition I set about creating some sketches; discovering I enjoyed certain elements of each, I came up with what is now (for now) a final composition . 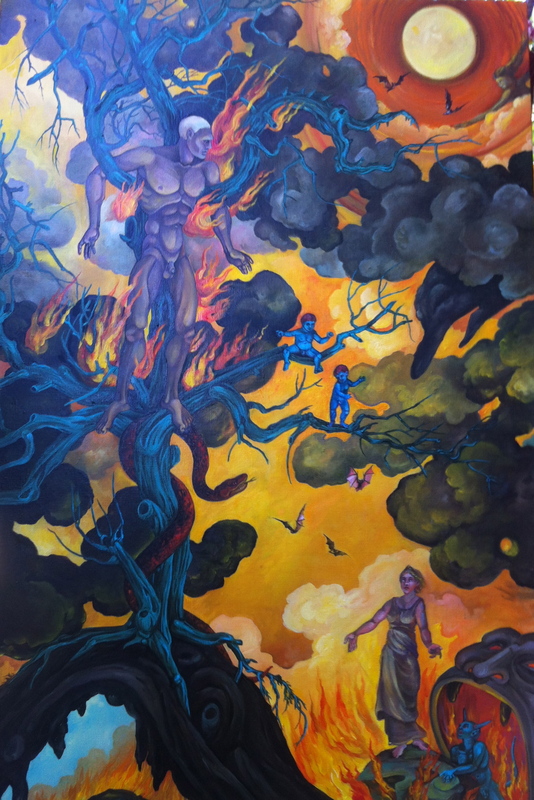 The scene depicts the moment in the Underworld Xibalba when the freshly sacrificed Maize God, Hun Hunahpu is placed upon a calabash tree (some interpretations mention the tree as the World Tree-the Axis Mundi). 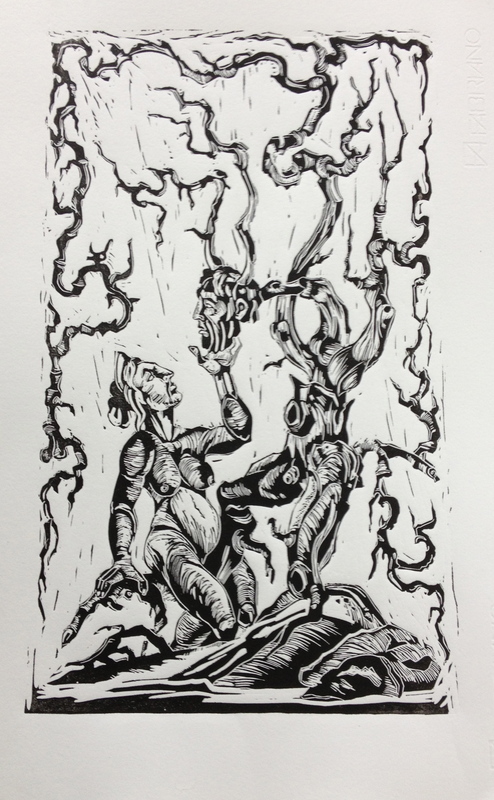 The orthodox depiction of the scene is one in which only his head is placed amongst the branches; as I have a difficult time resisting the full form, I took some liberties. Mayan scholars take heed. With our hero dangling like strange fruit, the Xibalba princess Xquic searches out this forbidden treasure (sounds familiar?). The Maize God upon encountering the Princess spits into her hand (subtle romantic move on his part) and from this spittle the Hero Twins are miraculously conceived , one more virgin birth in the canon of world mythologies. It is this scene I depict, one where the infant Hero Twins float between their parents; soon the Princess will depart the gloom of the Underworld for the sunshine of the living earth. A new adventure will begin for all of the characters. This is of the Hero Twins, my inspiration was the many early Renaissance depictions of the Annunciation in which the Christ Child is depicted as this wee little babe floating within a nimbus of light. And at last, the Princess ( with her demonic cousin Ralph). 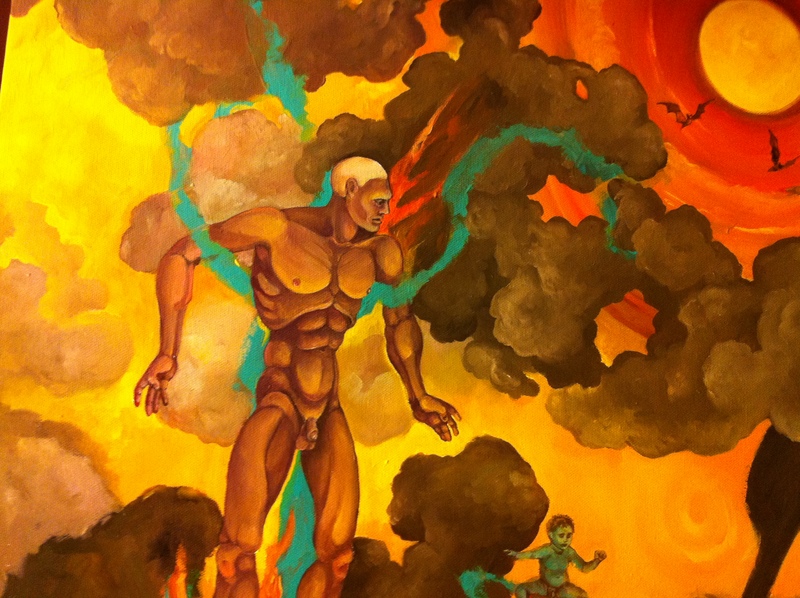 With that I close, having attempted to depict an epic tale of wrathful demon-gods, a virtuous savior, a virgin birth and heroic infants on a rather limited 20 by 30 inch canvas. I am now working on a primer, a primer of New Spain. The first letter of course being “A”, will be devoted to the Axis Mundi. So far it looks like it will be handsome. It has been a bit since I last posted, it isn’t that I haven’t been painting, but I have been hesitant to post the progress. I had started a new painting in anticipation of a show in LA, a show I have participated in before devoted to work on paper. Most of my recent work aside from the maquettes have been oil on canvas. The following image is something I am considering submitting. I believe I am close to finished, perhaps some enhancements here and there, but for now, finished. Clive Hicks-Jenkins has repeatedly suggested to consider all work as a basis for another, scraps of random sketches proving a rich resource for more developed work. I believe him, most particularly when I see his own admirable sketches. Alas, my own scribbles are often merely that, scribbles. But some do prove inspirational. The following painting was inspired by a very random “scribble-note” taken in a class devoted to Mesoamerican art and culture. That class has been the original impetus for this latest body of work devoted to the Popol huh;the admittedly clumsy scribble acting as a guide for several paintings, this one in particular. 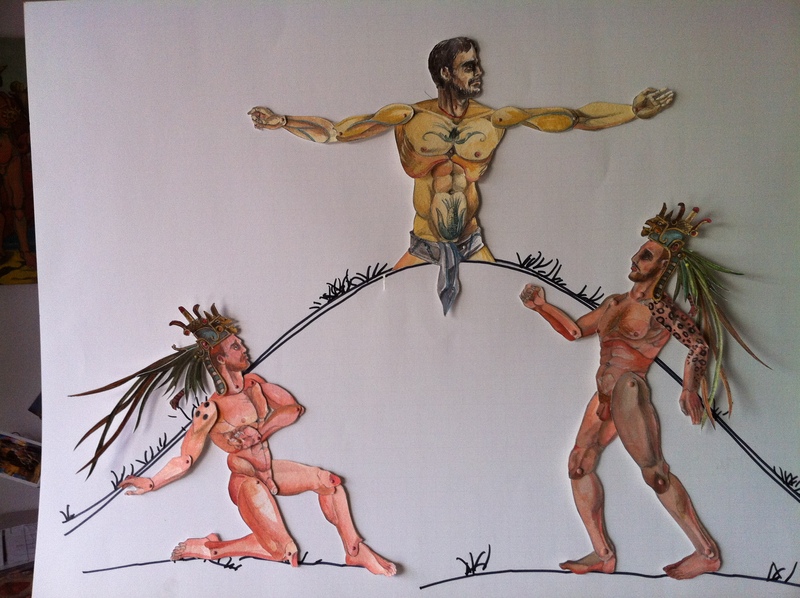 In this image we have the Hero Twins redeeming the honor of their vanquished father the Maize God. The Lord of the Underworld taunts their valiant effort, but he will indeed suffer the consequence of his hubris. The mother of the Hero twins Xquic looks on. 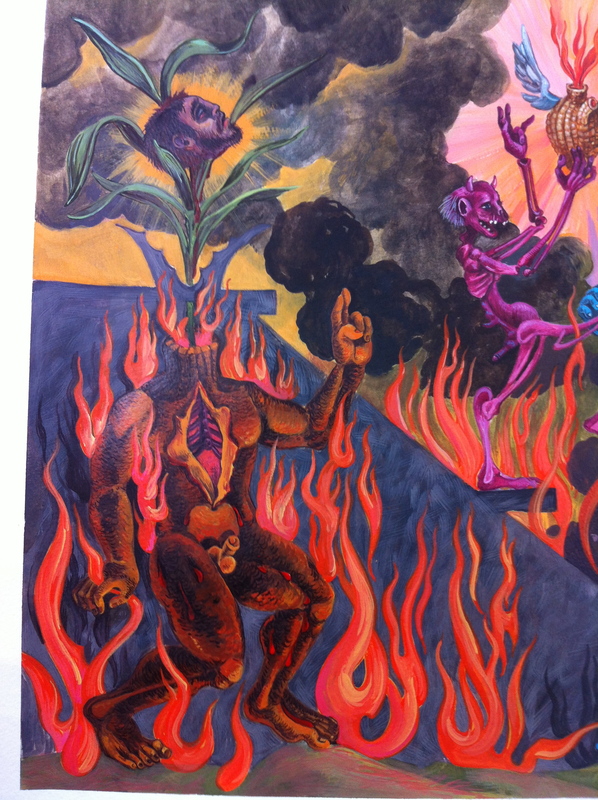 As noted this is a detail of Hun Hunahpu, the slain Maize God. In actuality the sacrificial gash would have been horizontal for those nerdy enough to care upon such Meso-minutia. The following is the sketch that I was speaking about. 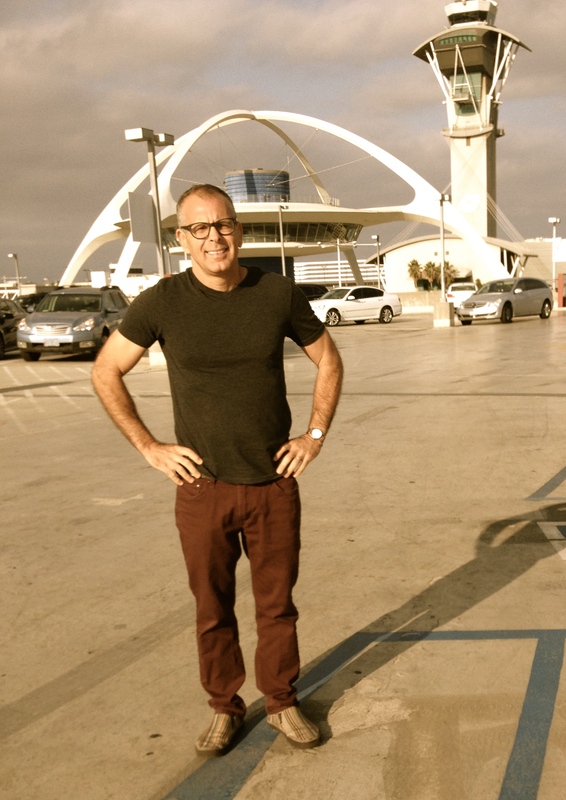 I happily spent yesterday in LA, I know I have been trapped in the boondocks a bit too long when LA seems the epicenter of urban sophistication. Such snarkiness aside, LACMA is one of my favorite museums and a really marvelous show devoted to women surrealist living in Mexico is soon to close, for more info, follow this In Wonderland link. It was a truly spectacular show, Leonora Carrington is my new idol, I knew her work essentially from one painting at the Met; having experienced so many of her paintings I am a convert to her cult. 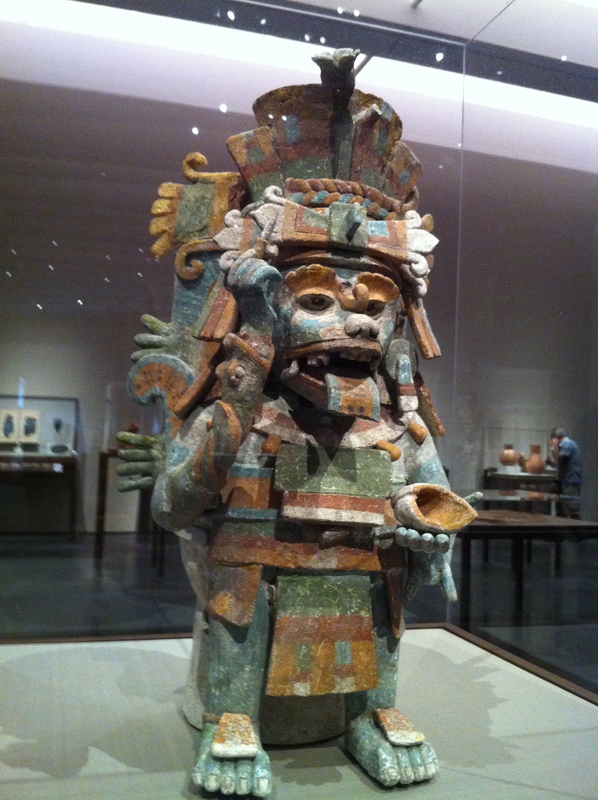 Another show I was eager to catch was Children of the Plumed Serpent, the Legacy of Quetzalcoatl. It was as I had hoped spectacular. It was very rich in luxury goods traded amongst different Mesoamerican people, polychromed pottery, dazzling gold work, mind boggling micro mosaics. Stunning. This funny little fellow, a censer is crafted to resemble a scribe, I figured visitors to this site would be tickled by his pen and little shell holding pigment. He is in remarkable shape, 30 or so inches, a handsome little bugger. 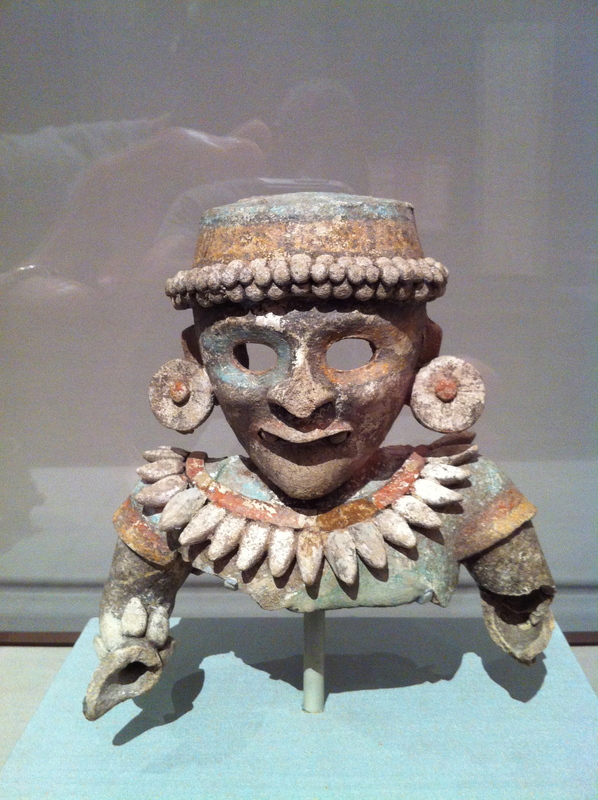 The following is a fragment of a censer, he is so grave and impressive. I was very drawn to him, he will feature somewhere , somehow in a painting or drawing . Although I thoroughly enjoyed my time spent in my old hometown, I am happy to be back in the studio. My little pug-dog Rose was quite peeved with my audacity-how dare I leave her in the care of her nanny? all day! It has taken most of the day for her to “speak ” to me again, I’ve promised her I will lock myself in the studio, a slave to painting and to pugs. 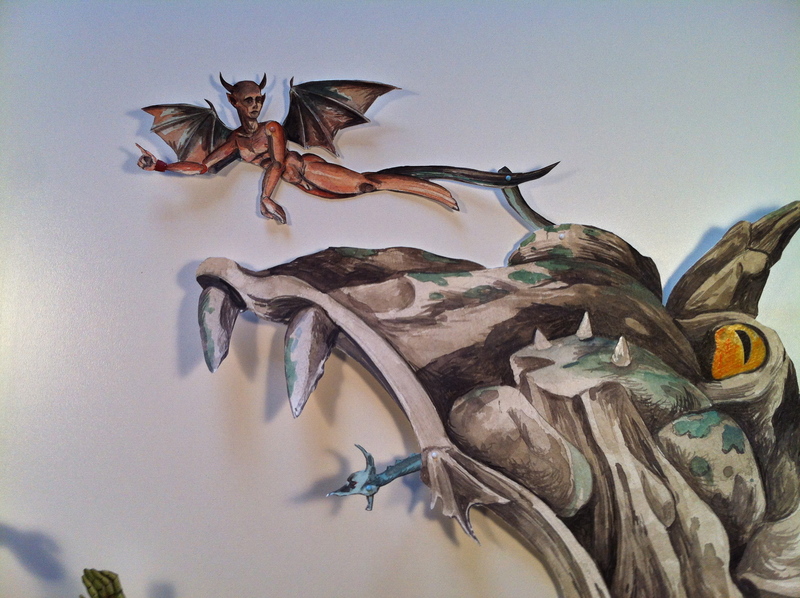 Today I was trying to ready some images of my maquettes for Clive Hicks-Jenkins. The making of the maquettes is great fun but I feel a certain hesitancy in posting the compositions, fearing they might not be just right.As we all know a composition is meant to be fussed with and developed. 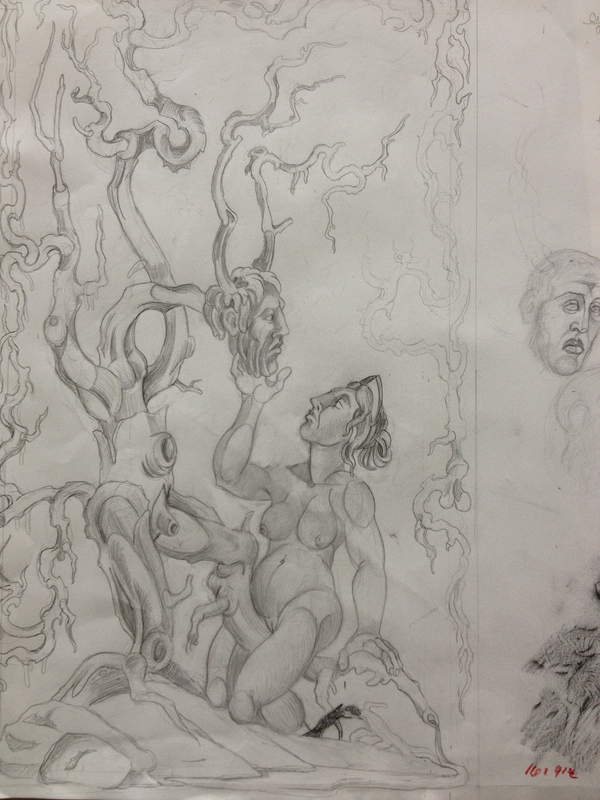 The compositions I submitted will most likely look very different when paint goes to canvas. This is true with the painting I am working on now, the progression from maquettes, to sketches, to proposal rendering has seen my figures twist and turn until I feel relatively satisfied. 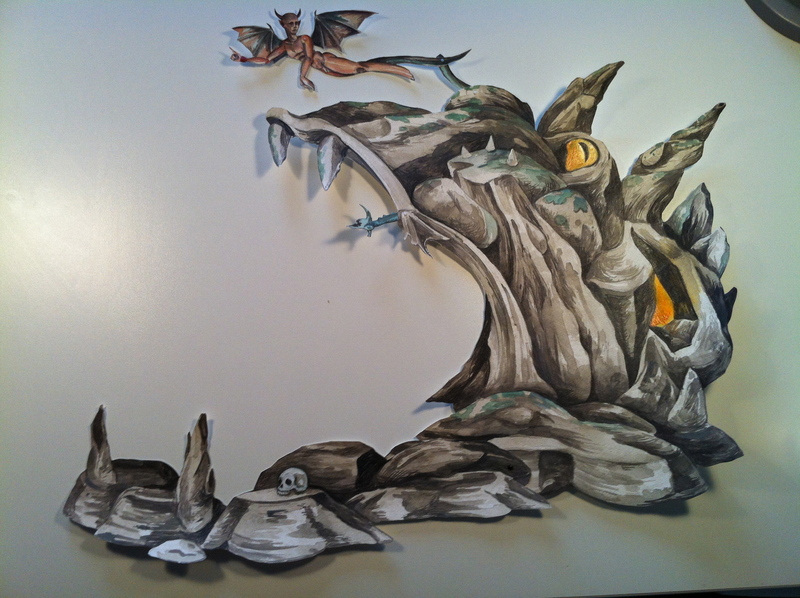 I have a bit of work to do still but I am closer to vague concept I had in my head. But for now, for tonight, I will just show unfinished snippets. As I said, still working out details but closer to what I had imagined. The following is of the sacrificed Maize God. 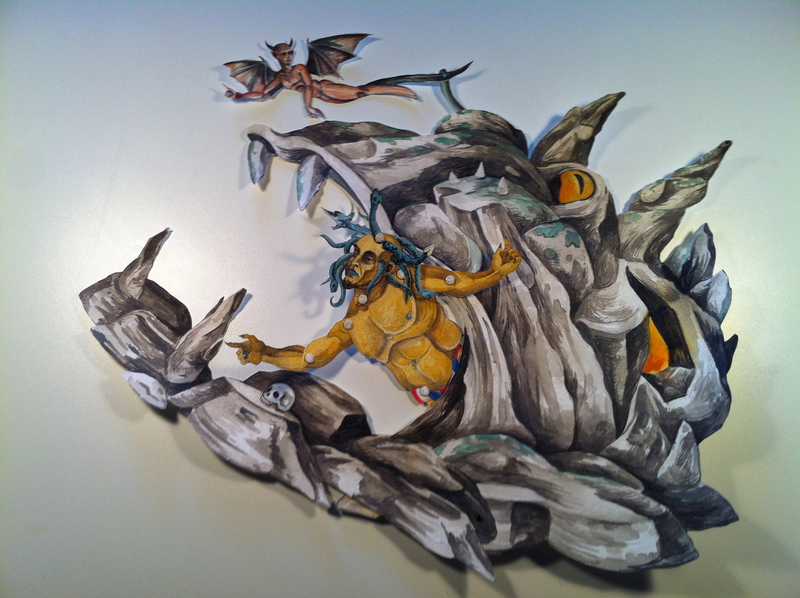 I’ve been enjoying painting the wild clouds of Xibalba, my years of decorative mural painting comes in handy at times. 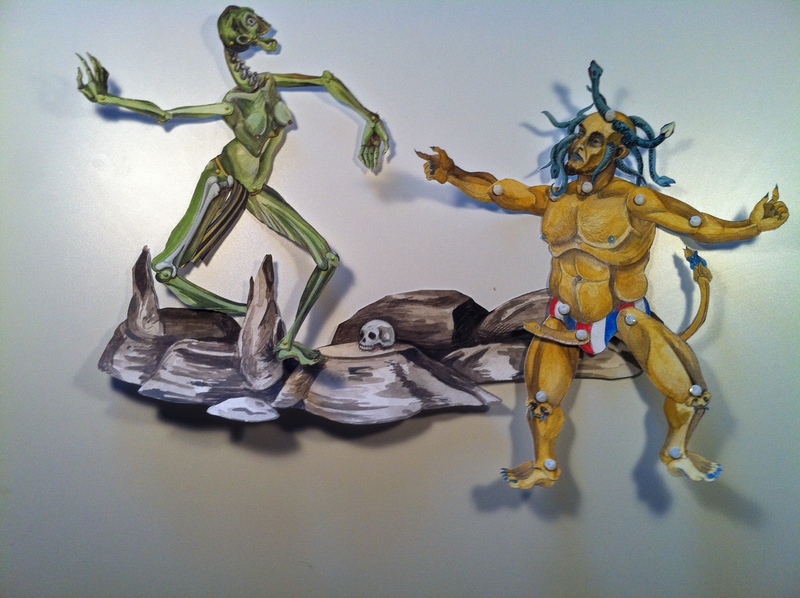 As I mentioned I sent some images to Clive, one of the maquette compositions might soon be realized as a painting. It is an idea I have been toying with and sketching out for some time. It is the Resurrection of the Maize God, his sons the Hero Twins having redeemed his honor, the Maize God like a vibrant shoot of corn erupts forth with vitality ( and a certain degree of virility). With this grand gesture, Man has a chance to survive. 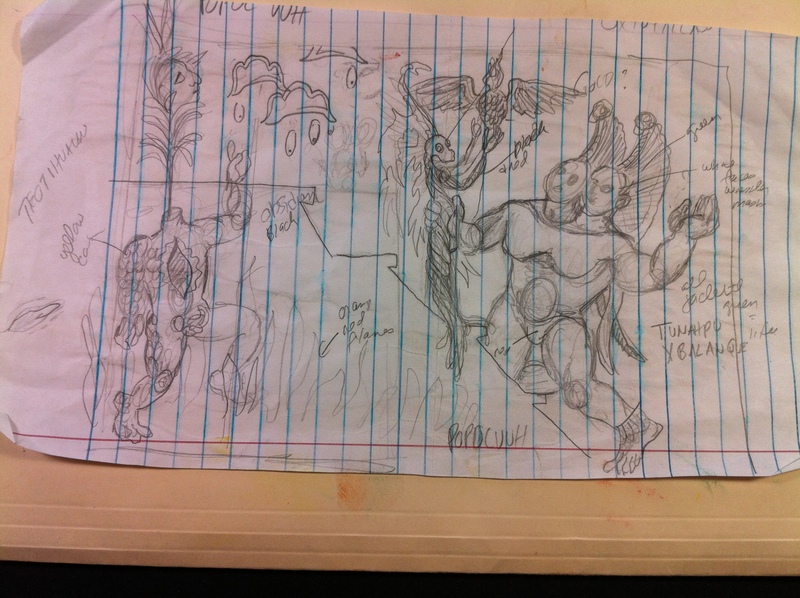 As can be seen it it a simple trinity composition, the Hero Twin Hunahpu to the left, his brother Xbalanque to the right, their father Hun Hunahpu front and center, savior like. The composition is loosely based upon a Late Classic Mayan bowl, the image is unfortunate, but one can get the idea. 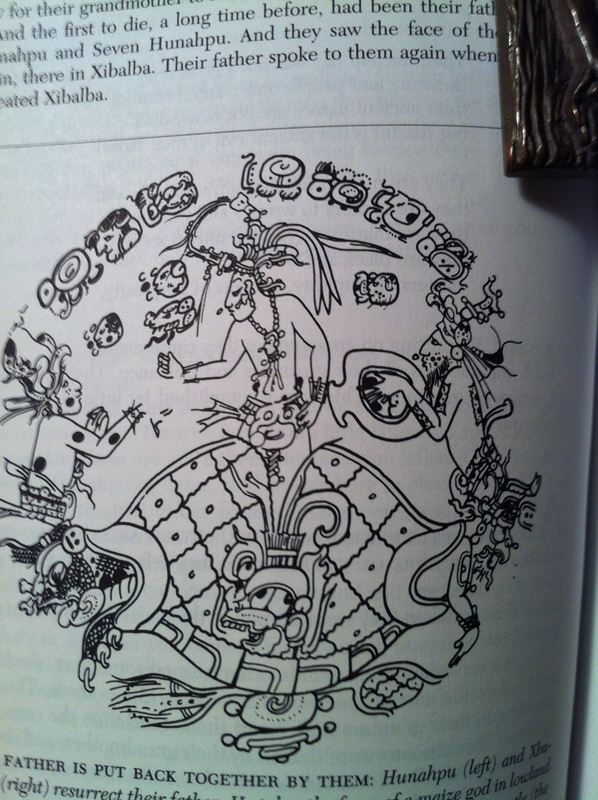 Scene from the interior of a Late Classic Maya bowl. Well that is it for now, a wonderful day, happy to have painted and composed my little cast of maquettes. I’ve missed making maquettes, so as my painting was drying I decided yesterday’s rain provided a great opportunity to clip away. I chose as my subject a place as opposed to a character . I chose Hell Mouth, the mythic entrance to the Underworld. There isn’t any reference to Hell Mouth in the Popol Vuh, but what the hell (pun intended). What is mentioned is the characters entering and leaving the Underworld through a cave-like portal. 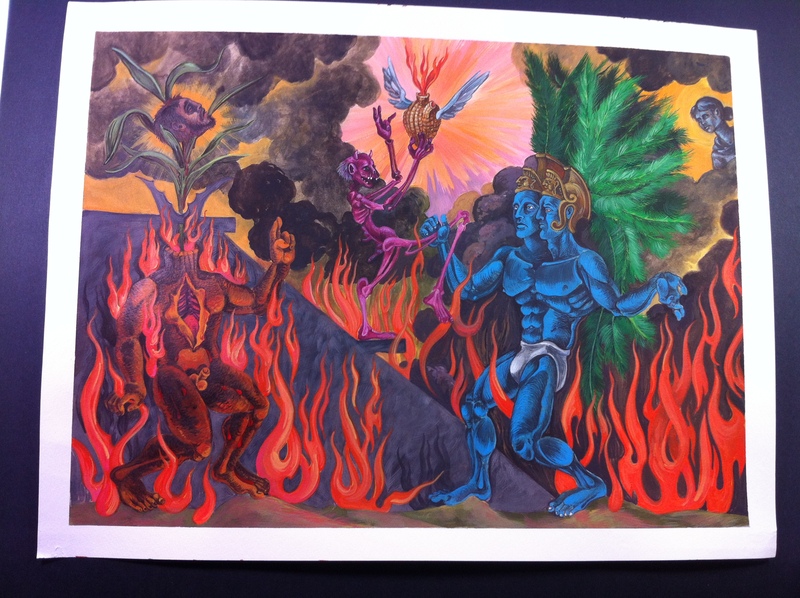 The device of the Hell Mouth, as I mentioned in an earlier post has many incarnations: Medieval and Elizabethan Morality plays, monastic manuscripts, Renaissance pleasure gardens, examples are found in Asia, even in Mesoamerica. I am cobbling together a post on this hellish topic on my other blog, Babylon Baroque, link found on side bar. 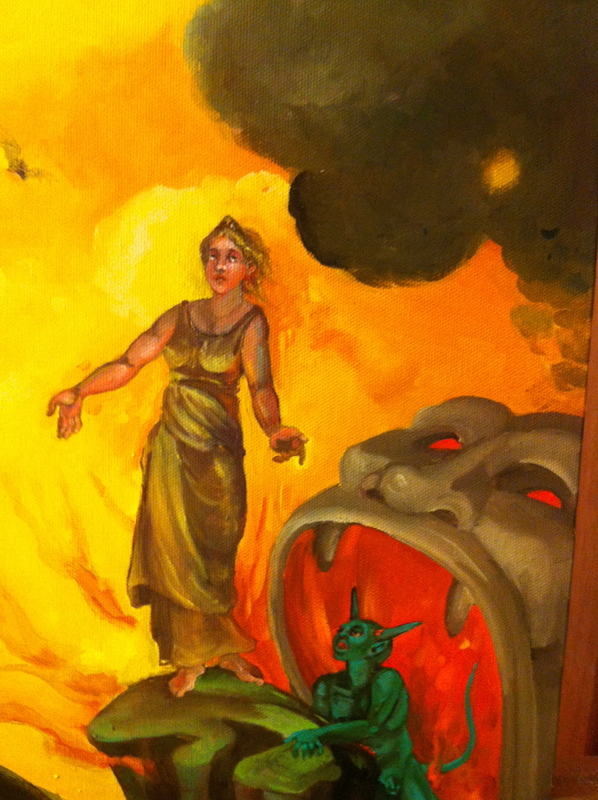 Update: new post on Hell Mouth up and running, check out Babylon Baroque, link in sidebar. My own vision of Hell Mouth is more Morality play theatrics than tasteful Renaissance grandeur, I have taste as subtle as a train wreck. My vision may lack discretion but boy can it articulate. I’m not sure if it is clear but the lower “jaw” of the gate is fastened by a brad allowing it to be raised drawbridge fashion. Dancing Demons on the lower jaw of Hell. 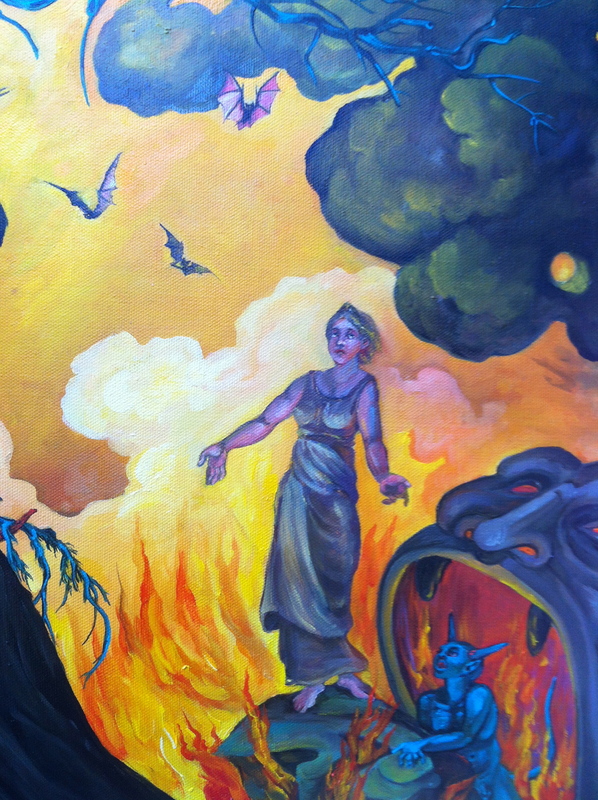 One part of the narrative is when the underworld princess Xquic is told to leave the Underworld by her Maize God spouse; pregnant with his children,the Hero Twins, she flees the sulphur aided by three owls (one depicted). As can be seen I had a bit of fun putting the tableau together. As I mentioned the lower jaw raises to better trap snarling demons and intrepid Hero Twins. Detached it provides a dandy bit of stage setting as can be scenes above in the ghoulish disco. Details follow, I like the wrathful demon and the little articulated gargoyle, the lower jaw of the gargoyle moves as does his body, not very necessary but fun to play with. Well that is it for now, I may put together the aforementioned post or I may return to the studio. The spouse returns tonite, I might not return to these pages until next week, until that time, take care.